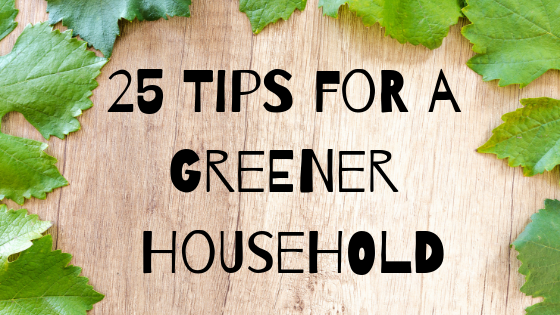 Live Green & Live Happy: A Quick Guide for People who Want Their Home to be More Environmentally Conscious. Environmentally friendly is a trend that has been around for a bit now. Luckily for ourselves, our children and the younger generation, as well as the planet we all share, living green is a trend that isn't dying off as quickly as high top sneakers or the Macarena dance. While electric cars are becoming more common place and eco-friendly laws are spouting up worldwide, you may wonder what, if anything, you can do to contribute to the betterment of all mankind. Turns out, there is a ton you can do, and all from your own home! Check out this list of ways to turn your house more green, and tweet me if you have any ideas of your own I may have left out! 25. If you have leaky drains, fix that right away! Not only are you costing yourself extra money, but you are wasting water. Hurting your bank account and the planet all at once, now that's what I call a bad move. To take that one step further, be sure to replace all your old faucets and toilets with water conserving varieties. Nowadays, there are even pipes specifically designed to conserve water, so think about getting those as well for the ultimate in water saving household technology. 24. When sleeping, lower the heat (since you're covered in blankets!) and make sure to do the same when nobody is at home. Purchasing a programmable thermostat is also a good way to save on energy costs. Also pay attention to the energy audit your utility provider sends you. Studying this document could be the key to understanding when you should be conserving more energy. 23. Weather strip your windows and doors! Your energy audit could point to you needing to do this, or perhaps needing new or added insulation. If you are producing heat, keep it inside the house! Letting it escape just creates waste. 22. Fluorescent bulbs make a huge difference in terms of energy conservation. They do cost a bit more than a conventional light bulb, however, they do last much longer so you get your monies worth. 21. At least once a month, possibly more for those of us with four legged friends who like to shed, but at least once a month change the filter on your furnace. The more dust on your filter, the harder your heater has to work. The harder your heater works, the more energy is wasted, and the higher your bill is. 20. In the summer, be sure to change the filter on your air conditioning unit at least once a month as well, and again, possibly more for those of us dealing with pet hair and dander all across their home. Do this for all the same reasons as the filter on your furnace. 19. While cleaning, use vinegar or baking soda instead of toxic chemicals. 18. Avoid plastic like the plague! Whether its furniture, eating utensils, cups or beyond, purchase household items which are made from naturally occurring materials, such as wood, glass and metals. 17. Also avoid any purchases with polyvinyl chloride (PVC/vinyl). This toxicity can show up in toys, shower curtains, flooring and many more unexpected places, so keep your eyes open when at the store making decisions on what to bring into your home. 16. Little Susie didn't finish her dinner? Don't throw it away, compost it! 15. Be sure to use nutrient rich soil for your lawn as well. 14. Substitute your paper products for non wasteful alternatives. Cloth napkins can replace paper ones, and a bidet is always a nice addition to a bathroom. 13. Always buy reusable items. Whether we are talking merely food containers and water bottles to razors and pens and even batteries, disposable purchases may be cheaper in the short term, but we all pay in the long run. 12. Believe it or not, many people are finding that washing their car when it rains saves tons of time, money and water! Throwing on a raincoat and dousing your car in eco-friendly soap the next time its pouring outside isn't just fun, it's smart. 11. Speaking of cars, don't use yours unless you truly have to. Try walking or bike riding to places that aren't too far from your home. Even carpooling does a lot to help prevent extra poisons tainting the air around us. 10. Buying local doesn't just help your community, it helps the whole world. Imagine how much gas is used to transport food across the country! Buying locally grown fruits, vegetables, meats and more helps reduce the amount of trips trucks take across the country, resulting in cleaner air and less gas consumption by all. You think your SUV is a gas guzzler? Try getting behind the wheel of a big rig! 9. Don't just stop using plastic bags, but shame those who do use them! They really have zero benefit to society, don't decompose, are toxic and kill animals in huge numbers every year. As silly as it sounds, plastic bags are a menace to our way of living. 8. No aerosol cans, not of any kind! 7. Avoid lubricants with solvents in them. Instead, use castor oil and/or other mineral oils to lube up your switches and hinges. On that same token, make sure your house paints are solvent free. The water based latex house paints are a great substitute. 6. If you do have some solvent based product, ask your garbage collector what you should do to dispose of them. This goes for motor oil too. Don't just throw this stuff in your trash can. 5. Recycling doesn't end at plastic and paper! Be sure to recycle your old computers as well, as the lead in them is a hazard to the environment. 4. Old letters and photos which you may throw away can be salvaged by donating to a local historical society. Who knows what people 50 to 100 years in the future could learn about life today by looking through your photographs and correspondences. You can also donate your old books to your local library, and old clothes to your local Goodwill. 3. Donate old refrigerators, dishwashers, washing machines and more instead of taking them to the dump. 2. Always be mindful of how many lights you are using while in the house, and be sure to keep your lights off, or mostly off, while not at home. 1. Don't let chemicals from your car or house ever make their way into your gutter! Most of these tips are easy enough to follow, so if we all put our best foot forward, we can work together to ensure that our children, and our children's children, can enjoy this terrific globe we all call home in the same safe and clean fashion we have been fortunate enough ourselves to have.